This collection presents six starship designs for use in Savage Worlds campaigns. 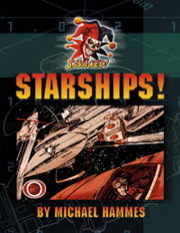 Includes ship descriptions, adventure hooks, game statistics, recognition sheets, and counters for the fighters. Includes a 1-page cover PDF, 15 pages of stats and information (in both graphics heavy and no graphics versions), a 10-page recognition PDF, and a 14-page counter PDF. Three of the ship designs in this collection were created from SkeletonKey Games' e-Future Tiles sets. While you do not need the SkeletonKey Games tiles to use these designs, they will prove very useful if you plan on running tactical encounters inside the ships (with minis or counters). To do this, you'll need e-Future Tiles: Star Freighter and e-Future Tiles: Star Hunter. Sign in to start a discussion about Savaged Starships! (Savage Worlds) PDF!